Israeli Haredi rabbis are moving toward regulation of the shapes of bourekas, the popular puff pastry filled with morsels of potato, cheese, mushroom, spinach, and various other fillings including meat. They are concerned that if bourekas continue to be baked in the same shape whether they are filled with meat, dairy, or vegetable mixtures, the public will become confused and possibly serve the meat bourekas at a dairy meal or cheese bourekas at a meat meal. 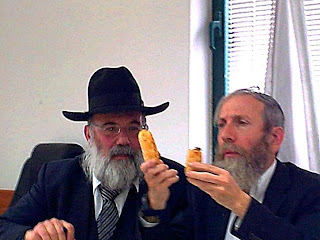 In a meeting with members of the baking industry, Rabbi Chagi Bar Guriya of the Rabbanut Harashit, demonstrated how despite their different shapes, it almost impossible to determine the filling of any closed pastry including bourekas, cigars and croissants, which has in the past created problems for both kosher consumers and those with food allergies. Saying that the health concerns for those with food allergies is an even greater problem than the potential kashrus issues, R’ Bar Guriya suggested that perhaps a new industry standard be adopted, with all pareve bourekas being completely closed, while those with dairy fillings be left partially opened so that their filling is visible, or using different shapes to designate the type of pastry filling. Members of the baking industry who were present at the meeting countered that not all the suggestions made would be possible to implement and further requested that any decisions made should be enforced throughout the entire country. The Rabbanut Harashit is expected to decide on an official policy shortly. As is often the case, the comments by Vosizneias readers are more interesting than the articles. Some make fun of the seriousness shown by the rabbinate on this issue and point out that there are more pressing issues that should command their attention. Others quote sacred texts and direct readers to chapter and verse justifying unique shapes for meat and dairy products. I wish they'd meet about how best to protect children within their communities at least as often as they meet about bourekas/croissants/pastries. There are about 1,000 issues they need to tackle before they deal with this so-called "problem". All satirical cynics can scoff all they want, but opening up Yorah Deah Ch 97 and view the content there will seperate (sic) between fact and paradiddle. We think that regulating size and shape of baked goods is a slippery slope that could lead to changing the appearance of cheese danish, limiting the size of soft drinks, and keeping the cigars separate from the partially open bourekas lest they (chas v'chalilah) lead to mixed dancing. Somehow our local kosher bakery found a simpler solution: all dairy baked goods are on gold trays, next to a sign that says all items on gold trays are dairy. A Joke to Start the Week: "The Waiter"